I recently started reading Bonnie Nardi and Vicki O’Day’s Information Ecologies, which promotes active analysis to ensure the right technology is used in the right way to drive values and results. As noted in the headline of this blog, I am trying to apply this thinking to my every day use of technology at work, home and everywhere in between. Rather than simply adopting to keep pace or just because, mindful consumers must first consider the purpose and potential repercussions.My last couple posts have discussed brand success on social sites like Facebook, Instagram and Pinterest. Leading with tips for user engagement on a scattered selection of social sites now feels like I started the story in the middle. According to Nardi and O’Day’s approach, the conversation should begin with considering the right social platform(s) to support your’s company’s values and goals. A common business best practice is to be proactive versus reactive. The newness of social media coupled with the swift pace of platform creation and adoption can force a reactive approach. We’ve all seen the doomsday articles, if you’re not already on Facebook you’re screwed. The fact is everyone is still figuring this out so don’t just jump on board to keep up. Presence on a social site does not ensure success. In fact, a poor social media presence can do more harm than good. How do site users communicate (e.g., text, image, video, etc.)? Does generating content in these forms serve the needs of your company and your customers? Understanding the way information is shared will help weed out which platforms work best for the types of content you aim to share. 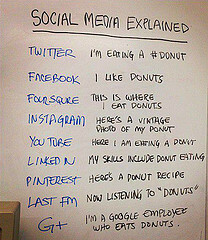 For example, I attended a social media conference session that discussed the visual power of Pinterest. The speaker specifically called out how dog breeders are getting major traction on Pinterest as opposed to more traditional social media sites. Combining impact photo with caption search capabilities and general sharing culture drives increased exposure and sales. With these differentiations in mind, remember that content should shift accordingly. See the picture above for a fun reference as to how different platforms approach the same topic. Also understand that these are not the channels for standard advertising. Avoid solely spotlighting your products and services. Generate fresh, engaging content that touches upon larger company and customer interests. Who is on this site? Is the company’s primary audience here or can we leverage site presence to attract a new audience? How do community members interact with other members of the community, specifically businesses? How will we address associate interaction with the site? Community is just as important as content. You have to know who occupies the site to best deliver relevant messages. Also consider how the community dynamic may impact ability to accomplish your goals. For example, Facebook and Twitter may provide the greatest exposure but this does not always equal ultimate customer engagement. Who is going to create content and maintain site presence? How many hours will be devoted on a daily or weekly basis? Will the company require software to maintain multiple social accounts? Social media is celebrated as a free opportunity to reach customers; however, an effective social media presence requires devoting significant time and resources. And you need to be flexible because these requirements may fluctuate according to the flow on the site. I think we’ve all seen crisis control scenarios explode on social media sites. If you haven’t, I’d recommend reviewing Applebee’s social slip up for a quick tutorial on what not to do. How will a social media presence benefit the company? How does social media success translate to improved business? Social media can be used for a variety of objectives, like increasing sales or improving customer engagement, so take the time to determine what it is you are chasing and how you will measure success. As noted, social media is still new so you’ll need to clearly articulate why you are there and how you will demonstrate ROI to get executive buy-in. As always, this is just a quick list to get the ball rolling. Also remember that this exercise will need to be repeated as company direction and the social media landscape evolve. For example, Facebook may have previously been the youth lifeline, but according to CNN, the younger generation may be migrating elsewhere. This change requires regrouping and reconsidering to ensure we are not just reacting. I think Nardi and O’Day’s approach really is a perfect approach for considering expansion to other social platforms for a company. Especially companies with limited resources. Which seems to be all of them! Ha! Thanks for commenting! And I agree, tight budgets and social media skepticism add to the pressure of picking the right social platforms.